thiruvAimozhi – 7.6.9 – kANdungolO? nenjamE! In the ninth pAsuram, AzhwAr says “Oh heart! Will we see the son of dhaSaratha who killed rAvaNa et al?”. nenjamE – Oh heart (which colluded with him for the separation)! rAvaNa a demoniac person by birth, was very cruel, and was thinking about and performing the great task of actions leading to harm for other, was having valorous, prideful masculinity, and lion like bravery which hurts others, and was having huge pride; emperumAn severed such rAvaNa’s clan without any trace; further he granted the kingdom of lankA with expansive oceanic water to rAvaNa’s brother vibhIshaNa; he mercifully returned to SrI ayOdhyA, ruled over the kingdom as the crowned emperor for eleven thousand years; he returned and remained in his exclusive abode, paramapadham which is in the form of lustrous light; oh heart! will we see him mercifully seated revealing his supremacy, like the best among the lions [as a leader] for nithyasUris? Implies – just as he killed rAvaNa, kumbakarNa et al along with their descendants and granted the lankA kingdom to vibhIshaNa, he will eliminate my anyathA gyAna (misunderstanding the attribute of a particular entity incorrectly) and viparItha gyAna (misunderstanding the entity itself incorrectly) which are caused by rajas (passion) and thamas (ignorance), and kAma (lust), krOdha (anger) which are caused by such anyathA gyAna and viparItha gyAna, and grant me full expansion of knowledge which is caused by sudhdha sathva (pure goodness). Will we see such emperumAn who is served by nithyasUris? kANdungolO nenjamE – Will you who accompanied me to hug and cry out loud in separation, be with me and see him together when we enjoy him without anything else to do? kadiya vinaiyE muyalum – He separated perumAL (SrI rAma) and pirAtti (sIthA) and made them live separately, similar to separating mother and father [which is a very cruel act]. There is nothing lower than his such lowly act. His cruel acts are such that sarvESvaran cannot remain peaceful thinking “let me punish you in the course of time”. As said in dharma SAsthram “ihaiva palam aSnuthE” (for greatly pious acts and greatly vile acts, one will reap the rewards/punishment in this birth itself). By the avadhAraNam (“E” in vinaiyE), it is clear that he does not have any noble qualities at all. AN thiRal … – A demoniac person who is like a valorous lion, in masculinity. meeLi – lion. Alternative explanation – eliminated the clan of rAvaNa who has valour, ability to hurt others and pride of death. Eliminated the whole clan as said in SrI rAmAyaNam AraNya kANdam 64.66 “karishyE maithilee hEthOr apiSAcham arAkshasam” (For the sake of sIthA, I will eliminate the clans of ghosts and demons). avan thambikkE viri nIr ilangai aruLi – [Is being rAvaNa’s brother, a reason for emperumAn’s acknowledgement?] His comforting words in SrI rAmAyaNam yudhdha kANdam 18.34 “yadhi vA rAvaNa svayam” (Even if rAvaNa had come [bring him along, he too is given refuge]), look good. SrI rAma was patiently waiting to hear “it is not just someone related to rAvaNa is here, but rAvaNa himself is here”. Is it not sufficient if someone from lankA was accepted? Why is he expecting rAvaNa himself to arrive and surrender? If someone related to rAvaNa is accepted, only he along with few others who accompanied him will benefit; but if rAvaNa himself arrived looking for refuge, the whole town will be protected; now, though rAvaNa was too advanced in unfavourable thoughts, he is most desired by emperumAn to be protected. Now, emperumAn’s anguish in not having rAvaNa take refuge was eliminated only after accepting vibhIshaNa. As vibhIshaNa introduced himself as in SrI rAmAyaNam yudhdha kANdam 19.4 “anujOrAvaNasyAham” (I am the brother of rAvaNa), emperumAn too accepted him considering him to be “rAvaNa’s brother”. viri nIr ilangai aruLi – Bestowing him the kingdom of lankA which is surrounded by oceanic water. 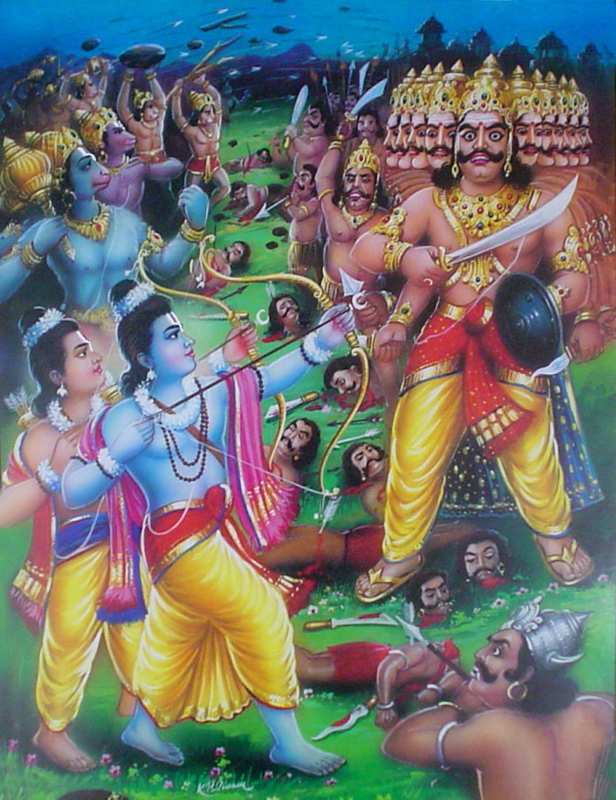 mINdum – ANdu – After the killing of rAvaNa, brahmA and other dhEvathAs said to SrI rAma “We have accomplished our task, by placing your highness as the target of arrows; now your highness can ascend to paramapadham”; at that time rudhra said “Your highness shall not do that; as your coronation was stopped, your divine mothers are all anguished; the whole kingdom is suffering; SrI bharathAzhwAn is also in grief; hence, as said in SrI rAmAyaNam yudhdha kANdam 122.4 ‘ASvAsya bharatham dhInam‘ (to pacify SrI bharathAzhwAn who is suffering and others), you should mercifully return to SrI ayOdhyA to eliminate the suffering of SrI bharathAzhwAn et al, become crowned and uplift the kingdom”, and as that was pleasing to his divine heart, he remained there for eleven thousand years and mercifully uplifted the kingdom. than sOdhi pukka – leaving the abode where he can be attacked with arrows and ascending to his distinguished, infinitely radiant abode of paramapadham. amarar ari ERRinaiyE – Will we see his presence amidst nithyasUris who are favourable by nature and focussed on service to him only, instead of hurling arrows at him? Just as a bull will walk around pridefully amidst a herd of cows, as the nithyasUris praise him, his prideful presence there is explained. The goal is to see emperumAn’s divine presence in the assembly of nithyasUris. This entry was posted in thiruvAimozhi, thiruvAimozhi 7th centum on October 2, 2018 by Sarathy Thothathri.